How To Coupon: 5 Ways To Organize Coupons! 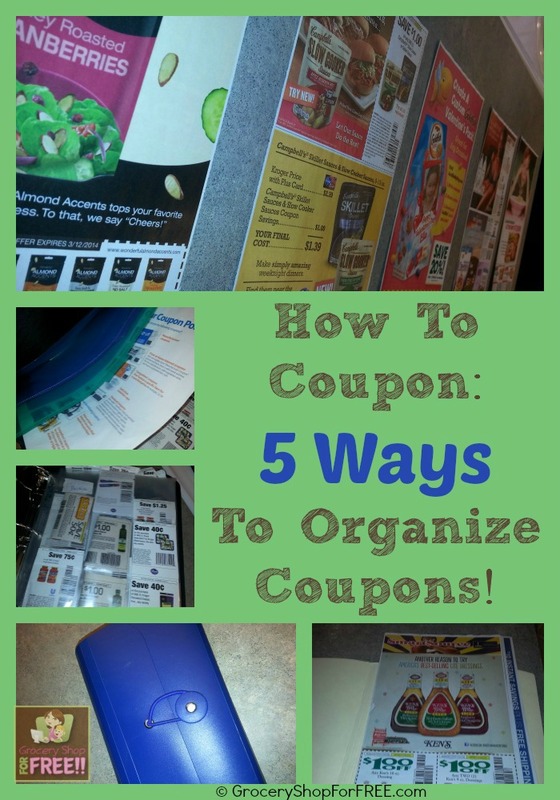 You are here: Home / Finance / Couponing / How To Coupon: 5 Ways To Organize Coupons! So, hopefully you have gathered your coupons using the 10 Places To Find Coupons post from this How To Coupon series. 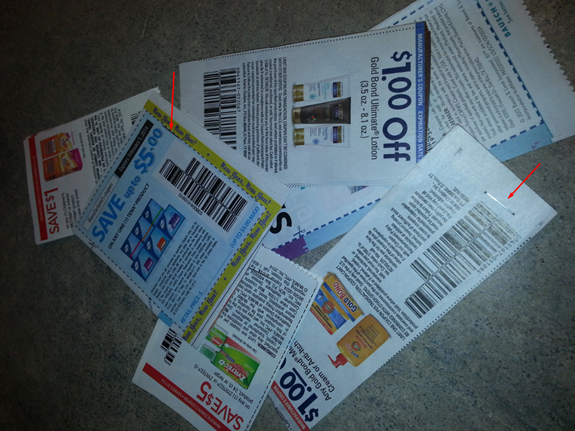 Primarily we will discuss 5 Ways To Organize Coupons from coupon inserts. The rest can be filed the same way as the insert coupons. 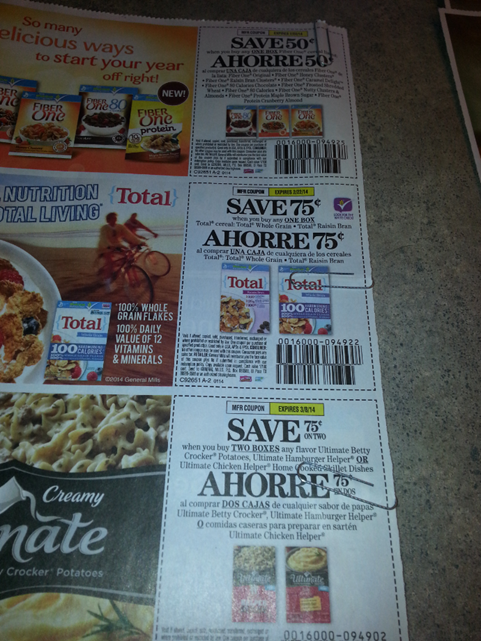 Now coupon inserts, as we discussed before, are coupon booklets found in the Sunday paper. There are Red Plum (RP), Smart Source (SS), Procter & Gamble (P&G), Target, Unilever, and General Mills (GM). You are going to want more than 1 of the same coupon when you start coupon shopping. We’ll discuss why in a later part of the series. But, for now we are discussing organizing multiple identical coupons. a. You can file them whole by date and name and then when you are ready to use them you can go to the specific folder and pull out the ones you need and get your coupons. Be sure to file them spine side out, if you look closely at the spine on each insert you will see the date, in case you ever need to know if they are misplaced. b. You can file them separated by page and either stapled or paper clipped together. this method will allow you to cut out a group of coupons instead of just one at a time. I normally buy 10 papers a week, which gives me 10 identical coupon inserts from that week. For instance, if there are RP & SS inserts in the paper that week I will have 10 SS and 10 RP for that week. I will begin by taking the first of the 10 and laying each page out in order, then I will take the second identical insert and lay the same pages on top of the same pages, so that now I have 2 of each coupon page laying on top of each other. I continue that until they are all 10 laid out. I will have 10 copies of each page laid out in order. 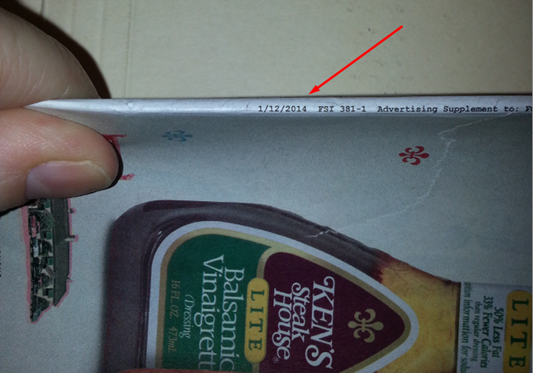 Then I will either paper clip or staple each coupon stack by stapling or paper clipping each coupon, being sure to never staple through the date, bar code, or return address. So that, when I am finished I have 1 set of 10 identical pages with each coupon (front and back) on that stack being either stapled or paper clipped. This comes in handy when you are ready to cut out individual sets, they are already all paper clipped or stapled together, plus they hold the page still for you to cut through 10 sheets. 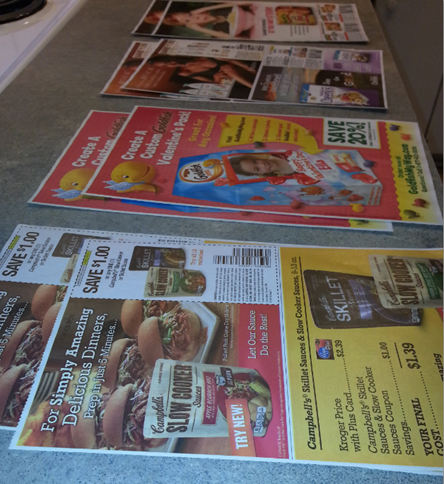 Then you can file the entire insert by date and name, and when you go to pull the coupons you want they will be all together and ready to just cut them out. 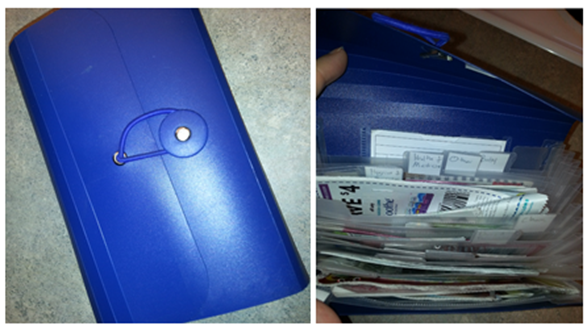 You can clip all of your coupons and then file them in a notebook that you take with you to the store. That way if you find a deal in the store you have all of your coupons with you! You can use baseball card holders, or photo book pages whatever works for you. 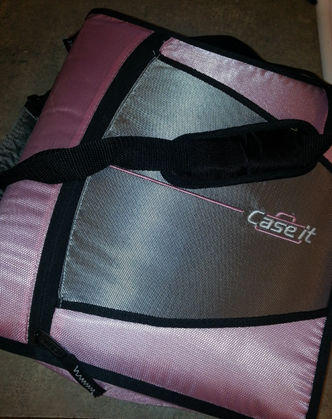 I bought one with a handle and zipper and pockets for scissors, paper clips and a pen, as well as a place for things like rain checks and receipts. Use dividers just like you used in school to separate your categories, ie: Dairy, Deli, Frozen, and so on. Set your notebook up like your favorite store is laid out so it’s easier to navigate through the book and the store. You can cut them and file them in a file box or shoe box and use index cards to separate the categories. You can cut them and put them in baggies and label the baggies in categories. 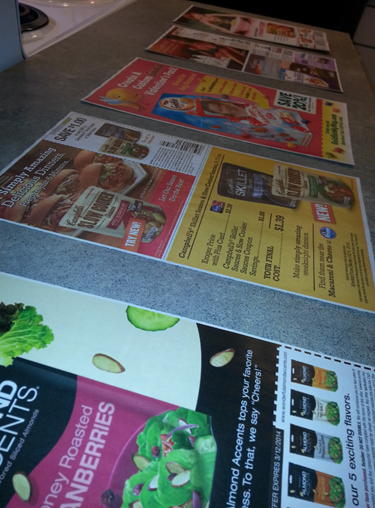 As you can see there are many ways to organize your coupons. You may try all of them before you find one that is just right for you, and it may not be any of the 5 Ways To Organize Coupons above! Nothing is better than shopping with coupons. I never leave. home without them.Best shopping spree was when I bought 215.98 worth of groceries for only 2.33 cents. That was what i paid for tax. Definitely made an impression on my dad!!! 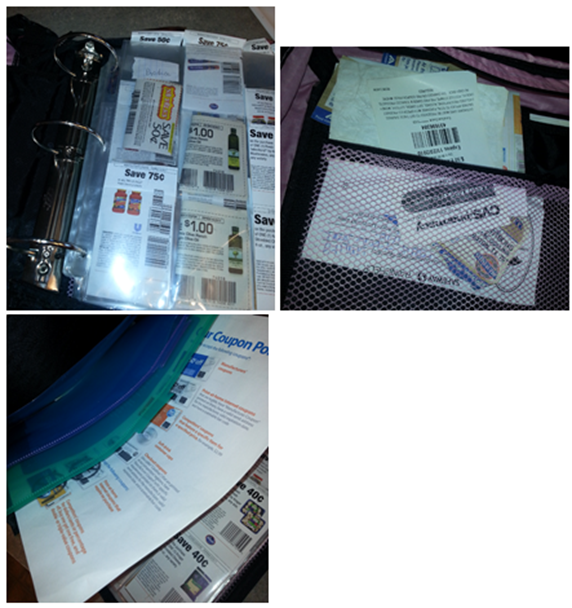 Thanks for sharing – I gave you a share over at http://www.makingorganizedmoms.com/becoming-organized-shopper/ today. I’d love to have you check it out! Thanks – that is a great post!